Home / IELTS Tips / Writing Tips / How to Do Line Graph Type of Question in IELTS Writing task 1? Line graph is another kind of chart type question in IELTS writing task 1 and the strategy to solve this question is very similar to bar chart question. In this type of question, you may find two types of line graph; simple and complex. In the simple type of line graph question, you may find one line in the graph but on the other hand, in the complex question, you may get two or more than two lines in the graph question. These lines can be of different colors or different types. For such complex line graph questions, labels are given at one side of the graph in order for you to identify which line corresponds to which data. Let us find in detail how to solve line graph type of question in IELTS Writing Task 1. You should never solve IELTS writing task 1 line graph question without reading it thoroughly. If you do so, you would be missing out something important. Once you read the question, just have a look at the line graph as well. Check its heading since the topic may give you better idea of what the line graph is about. Also, do find out its x-axis label and y-axis label where you can get to know units which you can include in the introduction, for example, “in the period of 10 years”, “from 1970 to 1980” etc. You can write one body paragraph in detail if you have got a simple line graph in the IELTS writing task 1 question. 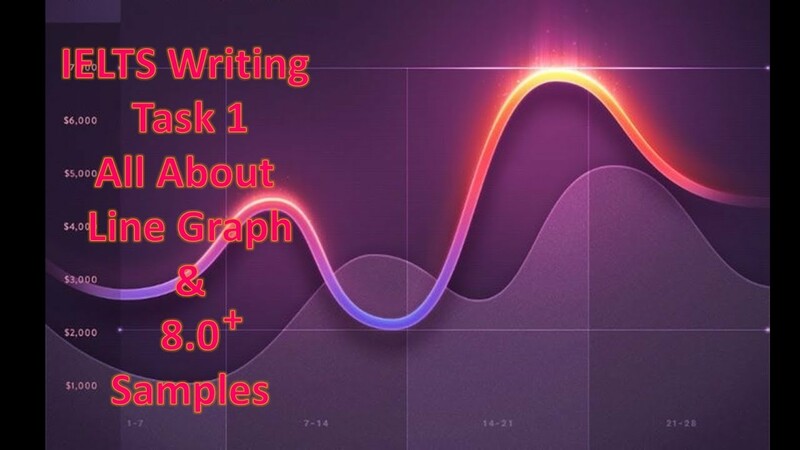 However, if you have been given two or more lines in the graph, you can prefer writing two body paragraphs so that you are able to mention enough details about them. In this case, you can first try to write about the individual lines in the first body paragraph where you can mention the starting point of a line, the peak points and the trends such as gradually decreasing, constantly increasing, stable etc. In the second body paragraph, you can write once you compare the multiple lines together. In order to write about the highlights of a line graph in IELTS writing task 1, you should be able to make good comparison of the lines. Here, you may like to notice if there are intersection points of the lines or if two lines are following same trend of being constant over a period. Then, also mention the peak points at the start and at the end along with the corresponding data and also write whether it was at maximum or at lowest. These important highlights are nothing but the key features that make your writing task very scoring. A writing task response without main summary would be losing out band score. Hence, you must include it in your conclusive statements which you may prefer to write after introduction or after your body paragraphs. 5 challenges nurses face while answering IELTS writing task 2.